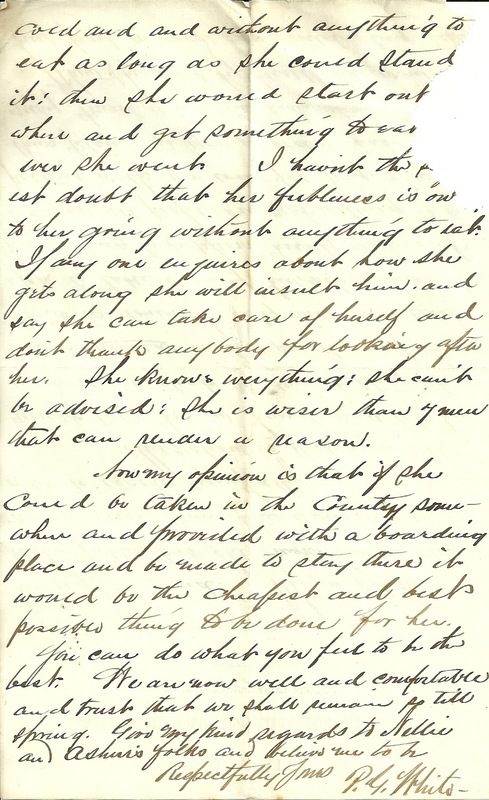 Poignant letter written by P. G. White, Attorney and Counsellor at Law, No. 2-1/2 Strickland Block, Kenduskeag Bridge, Bangor, Maine. I have only the last sheet of the letter, which is missing a small piece. Consequently, I don't know to whom or about whom the letter is written, which is probably a good thing, considering the content. There is another clue in the content, though. her right mind. She is sick or rather feeble, but she feigns herself very much worse than she actually is in order to excite sympathy. 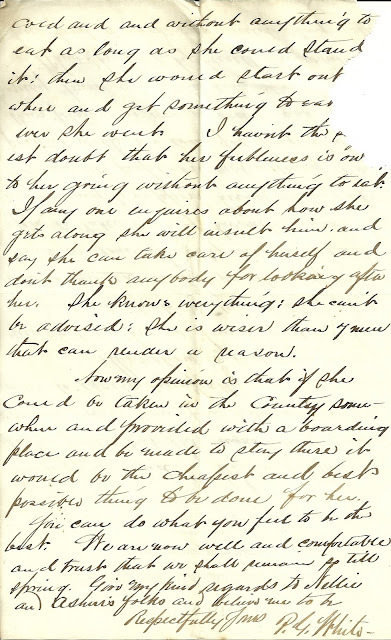 My notion is that some one must take her in hand, and let her understand that she must stay where she is placed; unless something of this kind is done, the city will be called upon to take care of her, not because she has nothing to support herself with, but because all people are not willing to be pestered with her even for pay. I write thus plainly to you in order that [piece missing] may know what the situation is. Now my opinion is that if she could be taken in the Country somewhere and provided with a boarding place and be made to stay there it would be the cheapest and best possible thing to be done for her. That last section has me wondering if the Nellie and Ashur might not be Ellen and her husband Joseph Ashur Ware, who was the son of the noted Judge Ashur Ware (1782 Sherborn, Massachusetts-1873 Portland, Maine), about whom I have written earlier. Joseph Ashur Ware's wife Ellen was Ellen (Willis) Ware, born in 1835 in Maine, the daughter of Thomas Leonard Willis and his wife Charlotte Elizabeth (Hall) Willis. Ellen had a brother Thomas Leonard Willis, who served in the Civil War and survived, but died in 1869, so, judging from the partially printed date on the letterhead, is not likely to be the letter's recipient. 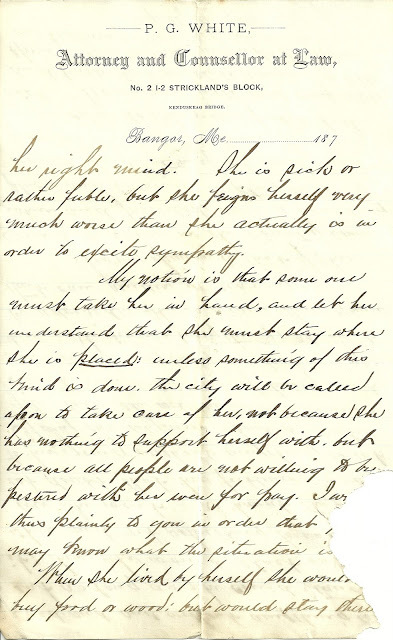 Ellen's sister Emily Hall (Willis) Pierce died in 1864 in Portland, Maine, and thus was not the letter's recipient, but her husband Lewis Pierce, a lawyer at Portland, Maine, is a prospect. P. G. White was, I believe, Peregrine G. White, born about 1846 in Maine. I found him in the 1870 Census of Bangor, Maine, as Peregrin, married to Maria, with 2 year old son Louis and infant Edith. In the 1880 Census, he was shown as P. G., married to Delina; with 10 year old Lewis and 8 year old Mabel, who I believe was not Edith, as a later listing shows Mabel with the middle initial M. Perhaps Edith died young. In the 1900 Census, he was shown as Peregrine G., married to Annie C., who was born in Canada about July 1859; Peregrine and Annie had married in 1888. In the household with them was Mabel M., about age 30, who indicated she was divorced. I've no information as yet on the parents of Peregrine G. White or his wives. I did find that his son Louis or Lewis married Grace B. and raised at least two children, sons, in Bangor, Maine. I believe Mabel married Edward C. Walker in 1893, a marriage that apparently didn't last. If you have any corrections, additions, insights or speculations regarding the information presented above, please leave a comment in the comments box or contact me directly.